US local broadcast giant Sinclair Broadcast Group is launching a streaming service that will take a raft of thematic channels and content from its roster of local channels to other markets across the country, with a local channel featuring programming based on the user’s location, along with video-on-demand content from each of its channels. The new service, STIRR, will be advertising-supported and free-to-view, and will be available on iOS and Android devices, Amazon Fire TV, Apple TV, Roku and the web. 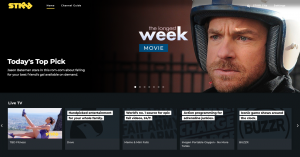 STIRR will feature a range of 20 themed linear channels at launch – game show offering BUZZR, Charge, Cheddar, sci-fi service Comet, CONtv, family service Dove Channel, sci-fi service DUST, ‘epic fail’ video offering FailArmy, Futurism, factual channel offering Gravitas, gaming channel Mobcrush, MovieMix, NASA TV, Outdoor America, The Pet Collective, SOAR, Stadium, TBD, The T and World Poker Tour. The company has also developed a range of original channels, including STIRR Movies, STIRR Sports, STIRR Life and STIRR City, with these and other linear channels to be added month by month to take the total to over 50 by the end of this year, according to the company. The latter, the service’s curated 24/7 local TV offering, will provide a programming line-up based on a viewer’s location, including live local news, local and regional sports, entertainment and city-focused lifestyle programming provided by the local Sinclair TV station in that city. STIRR City will not offer network programming offered by Sinclair-owned affiliate stations, with movies inserted during primetime instead of network shows. The service will be headed by Adam Ware, formerly head of digital media and business development at the Tennis Channel. Other key staff include Ben Lister, director of content acquisitions, and Stacie Anthony, editor in chief, who are leading efforts at STIRR’s Santa Monica headquarters. “Despite the explosive growth of new national over-the-top (OTT) services, local TV station’s programming, especially local news, has remained some of the most popular and desired content to audiences and advertisers alike,” said Ware. Sinclair has been planning the launch of a ‘skinny bundle’ streaming service for some time, and has also mulled the possible launch of an SVOD offering. Sinclair is currently involved in a legal dispute with rival Tribune Media over alleged breaches of contract related to the failed merger agreement between the pair that came spectacularly unstuck late last year. On the back of the Tribune deal there had been speculation that conservative-leaning Sinclair could also launch a rival to Fox News.